The new C7 Corvette were shipped out to dealers, what, ten minutes ago? And here's one already wrecked. This shot popped up on the great carspotting subreddit r/Autos yesterday under the headling "He didn't make it very long - C7 accident." The poster Inflame didn't know how the Corvette crashed, nor who it belonged to. 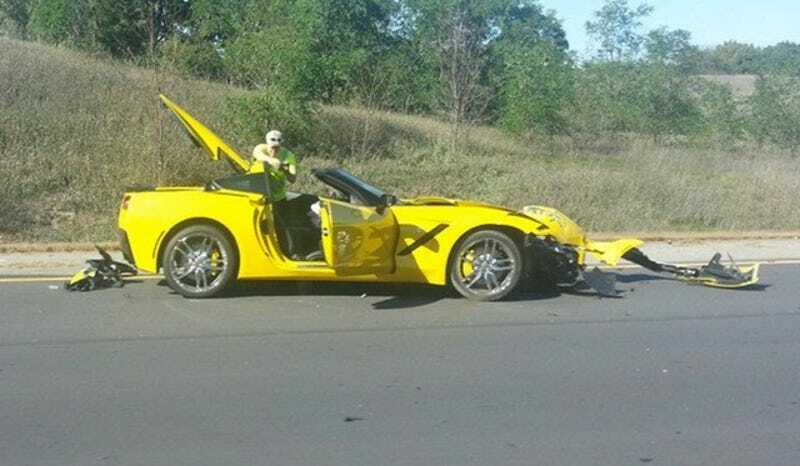 Still, it certainly looks like the first customer Corvette to end up in pieces. This would make it the third high-profile C7 crash so far (here's number one and number two), but hey Thanksgiving is coming up and we all know what that means. UPDATE: AutoWeek reports that there were no injuries.